Arcade Video Game published 25 years ago by Tecno Soft. 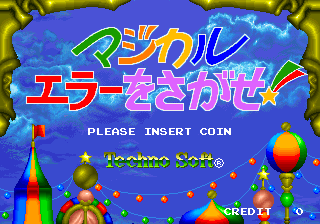 Magical Error o Sagase © 1994 TechnoSoft. Magical Error o Sagase is a spot the difference puzzle game for one or two players. In each level the player must point out the difference in the two images within the time limit. In contrast to most spot the difference games, in Magical Error wo Sagase, the images are mirror images of each other instead of direct copies. Incorrect guesses cause the player to lose time on the time bar and once the time bar is depleted the game is over. There are five levels per stage, and after each stage the player gets to play a bonus game to put more time on the time bar. Translates from Japanese as 'Search for the Magical Error'.